We are a full-service wildlife removal company, and we always aim for a permanent solution to wildlife problems. For example, we not only remove the wildlife from your house or building, but we determine how it got inside in the first place, and we seal shut all entry points with steel. We repair wildlife damage, and clean up animal waste, from nesting material to feces. Our job doesn't end at mere critter trapping. Our company is fully licensed and insured in the state of California. We service Dana Point, San Juan Capistrano, & San Clemente and have highly trained and experienced staff ready to address your problem immediately. Give us a call at 310-421-2554, and we will listen to your animal problem, determine the most reasonable course of action, quote a price for services, and schedule an appointment for same-day or next-day service. We answer our phones 24/7, so don't hesitate to call us at any time! We pride ourselves on the quality of our work. We do not perform pest control services in Dana Point, San Juan Capistrano, & San Clemente, and we do not exterminate or poison wildlife. We are professional wildlife control experts, and we employ humane and intelligent means for permanently solving wildlife conflicts. Trapping is an art that requires a lot of experience (not to mention the proper training, equipment, and licensing). We truly believe that we are the best wildlife operators in Dana Point, San Juan Capistrano, & San Clemente, and we back up our work with a guarantee. 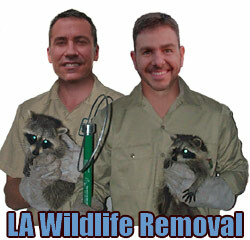 Go back to the Los Angeles Wildlife Pest Control home page. Email Time! Hello My name is Yeiner. I am a biologist and I am currently trying to mount a firm control of wildlife in my native country: Colombia. I work at an airport controlling wildlife on the Atlantic coast of Colombia and I have made some other minor work. I wonder if you can help me build this company in my country give my support to texts or any other form of assistance. I am thinking seriously of going to the United States, preferrably the Los Angeles, in mid-year, to learn more about the topic. Greetings, and a thousand thanks. Yeiner, Biologist.